This mistake reflects something that Paul Krugman has remarked upon in the US: the tendency of commentators to define the centre as simply today’s mid-point between the two main parties. So as Labour moves towards the Conservatives, according to this way of looking at it the centre also moves to the right. The most obvious example is the welfare bill, and Labour’s shameful decision to abstain on this. But another that is close to my heart is austerity. Talk to some, and being anti-austerity has become synonymous with being well to the left. Of course in reality it is just textbook macroeconomics, but if we stick to measuring everything on a left right axis, then remember that it was only as far back as 2009 that the need for fiscal stimulus rather than deficit reduction was the position advocated by a centre/left Labour party in the UK, and the Democrats in the US. It cannot be surprising, therefore, that among a relatively well informed electorate that is the Labour party membership an anti-austerity position is still seen as a sensible policy. With an extreme relativistic view you could say that by sticking to this position these people have moved to the left, but please don’t appear surprised that this has happened. It is equally fallacious to think that those who vote for Corbyn agree with every one of his policies. Some of his popularity may be a form of protest not just at the policies of his competitors, but also their style: see the clip in the middle of this typically amusing article by Mark Steel. I have an image in my mind. Its a bus running downhill, and its brakes have failed. There are four men in the front cab. The two men in the middle are both trying to control the steering wheel to keep the bus on the road. The man to their right has control of the accelerator, and is pushing on the gas hoping this will crash the bus to the right. The fourth man to their left controls nothing, but as his pleas to stop pressing the accelerator fall on deaf ears, he begins to wonder whether it would be better for the passengers to grab the wheel and crash the bus to the left. The three other drivers do not agree on very much, except that it is all the fault of the guy on the left, and now appear to be thinking about throwing him off. As the bus hurtles downhill swerving from side to side, its passengers are battered, some injured, and a few are jumping off. I do not need to explain the symbolism. I tried to change the image to explain why the man on the right refuses to stop pressing on the accelerator of growing primary surpluses, but gave up because the real reason is that he wants to crash the bus anyway. (The argument that the Eurozone’s rules do not allow debt write-offs is just nonsense.) Otherwise I think the image works well. The two men in the centre represent Tsipras and maybe Hollande. Hollande is saying that if only you would let me have the wheel (‘structural reform’) all would be well, but in truth the main reason the passengers are being injured (unemployment and welfare cuts) or are jumping (migration) is the speed of the bus. The central question is whether the men in the middle are delusional. By keeping the Greek economy on the road that is the Eurozone are they only going to prolong the agony with the same inevitable crash which is Grexit? There is only one reason for optimism that I can see, although it assumes yet further reductions in Greek living standards. The hill the bus is travelling along will begin to flatten out and the road might even start to rise as Greece becomes more competitive in terms of price. I outlined here why that has not yet boosted the Greek economy to the extent it has in Ireland, but if unemployment remains at or above 25% Greece should get even more competitive. Instability and unwise Troika interventions may delay the process, but eventually the tourists will come. The Eurozone does contain a natural correction mechanism: it is just slow and painful. If this does eventually lead to sustained growth in Greece, it does not excuse what has gone before: recoveries do not justify recessions, and government profligacy does not have to imply a 25% fall in GDP! However this correction mechanism is not bound to succeed, if it is countered by another dynamic, which is one that has been and continues to be imposed by the Troika. 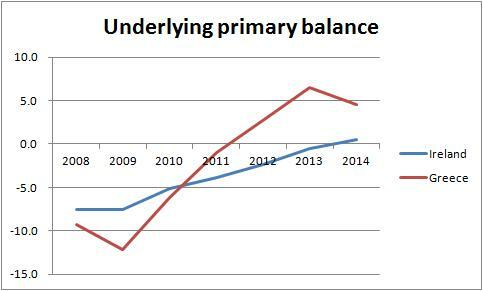 That dynamic is austerity chasing primary surpluses when that austerity makes the economy shrink. Macromodels would probably tell us which dynamic will win out, but they will not factor in a deterioration in the financial position of banks (already not good as Frances Coppola points out) as the economy stagnates, and the deteriorating social and political situation that austerity brings. So the eventual outcome still depends on the decisions of the Troika. It always has of course. The truth that their apologists find so uncomfortable is that the Troika has been in charge of the economy since 2010, and therefore is responsible for the mess we are now in. The idea that all would be well if only Greece had undertaken every item of structural reform they specified (and a lot was done) is just silly. Now it appears as if it is all the fault of the former Greek finance minister, because he dressed funny, or kept wanting to talk about economics, or did some contingency planning - it is so absurd you couldn’t make it up. One ray of hope offered by Anatole Kaletsky is that now “ritual humiliation” has been achieved, the Troika will be more forgiving. I wish he was right, but this argument fails to account for the German finance minister who clearly believes that exit is the best option. He wants the bus to crash for the sake of the other cars on the road. An optimistic view would be that the shock  of what was done to Greece a few weeks ago will bring others to their senses, and Schäuble’s influence on the Eurogroup (and strangely the IMF) will decrease. I fear the larger truth is that the non-German bloc in the Eurozone does not have an alternative economic vision to offer (although it clearly exists), and will never face Germany down. Someone wrote to me the other day to complain that my posts were always negative in tone. I understand where they were coming from, as there is a lot going on here in Europe to be negative about. However just to show that I can do positive, here is how the next few years could be relatively cheerful ones for the UK economy. The important point about today’s GDP figures, showing 0.7% quarter on previous quarter growth (not annualised), is that this has happened despite what looks like being a relatively poor quarter for employment. The combination means that UK labour productivity growth may have finally resumed after its six year pause. This while nominal wage growth shows clear signs of increasing. What we could be seeing is an investment led UK recovery. It all goes back to my favourite explanation for the UK’s productivity puzzle: that after the recession, high unemployment (both in the UK and Eurozone) pushed down UK wages, which led firms to put investment that would have led to labour productivity growth on ice, and just employ more people instead. (There may also have been direct labour for capital substitution of the kind beloved by macroeconomists.) With reasonable growth in demand this generated rapid employment growth, cutting the unemployment that helped cause stalling productivity. It was my favourite productivity puzzle story, not because I was sure it was right, but because it was optimistic. It was optimistic because, as unemployment fell and labour shortages began to become common, the process would stop and investment would resume. Provided demand continued to increase, both actual growth and growth in productivity might continue above trend and we would find that at least some of that output which pessimists thought was lost forever after the recession would return. I also thought there were some grounds for this optimism: stories about the pre-2007 trend being artificially inflated by debt were, well, inflated, and productivity innovations do not take six year holidays. The caveat about demand remaining strong was crucial, of course. Fiscal policy and you know who will not help beyond 2015, and neither has the recent strength in sterling. However lower oil prices go the other way. The big unknown is monetary policy. If nominal wages start rising before productivity growth resumes, that would be a trigger for the MPC to start putting on the monetary policy brakes too soon. They could still make that mistake, of course, but rising productivity growth coupled with core inflation below 1% should make them wait. I should add in passing that if this does all happen, it in no way excuses what has gone before. Strong growth after a long recession does not make the recession OK! The cost in terms of lost output (at first compounded by the costs of high unemployment) has been huge, and you know why I think much of it could have been prevented. I should also stress that this is an optimistic scenario, not a forecast. I know enough about unconditional macro forecasts not to do them. All manner of things could go wrong. But if this is how things do pan out, it will not just be good news, but it will also be fascinating from a macroeconomic point of view. It will show how you can have a prolonged demand deficient recession without persistent high unemployment, partly as a result of what economists call flexible labour markets. This was always something that could happen in theory, but I’m not sure we have many examples where it has happened. However, I should not allow my optimism to count chickens before they are hatched. Should central bankers stick to talking about monetary policy? Few disagree that the recent remarks on corporate governance and investment made by Andy Haldane (Chief Economist at the Bank of England) are interesting, and that if they start a debate on short-termism that would be a good thing. As Will Hutton notes, Hillary Clinton has been saying similar things in the US. The problem Tony Yates has (and which Duncan Weldon, the interviewer, alluded to in his follow-up question) is that this is not obviously part of the monetary policy remit. Haldane gave an answer to that, which Tony correctly points out is somewhat strained. Perhaps I could illustrate the same issue by going down a better route that Haldane could have used. He could say that the causes of low UK productivity growth are clearly under his remit, and one factor in this that few dispute is low investment. If he was then asked by an interviewer what might be the fundamental cause of this low investment, Tony would argue that his reply should be that he couldn’t really comment, because some of those reasons might be too political. I have in the past said very similar things to Tony when talking about the ECB, and their frequent advice to policymakers on fiscal rectitude and structural reforms. My main complaint is that the advice is wrong, and I puzzle over “how the ECB can continue to encourage governments to take fiscal or other actions that their own models tell them will reduce output and inflation at a time when the ECB is failing so miserably to control both.” But I have also said that in situations where fiscal actions have no impact on the ability of monetary policy to do its job (which is not the case at the moment), comments on fiscal policy are “crossing a line which it is very dangerous to cross”. The issues of MPC external member selection that Tony worries about are real enough, but perhaps that illustrates problems with the selection process. My guess is that the Treasury would be inhibited about choosing an MPC member who had previously been strongly critical of the government on other issues anyway. As I said my main complaint about the ECB is the nature and context of the advice they give, and at least by making it public we know about this problem. It is often said that central bankers need to keep quiet about policy matters that are not within their remit as part of an implicit quid pro quo with politicians, so that politicians will refrain from making public their views about monetary policy. Putting aside the fact that the ECB never got this memo, I wonder whether this is just a fiction so that politicians can inhibit central bankers from saying things politicians might find awkward (like fiscal austerity is making our life difficult). In a country like the UK with a well established independent central bank, it is not that clear what the central bank is getting out of this quid pro quo. And if it stops someone with the wide ranging vision of Haldane from raising issues just because they could be deemed political, you have to wonder whether this mutual public inhibition serves the social good. Here F could stand for folk. The story that is often told by economists to their students goes as follows. After Phillips discovered his curve, which relates inflation to unemployment, Samuelson and Solow in 1960 suggested this implied a trade-off that policymakers could use. They could permanently have a bit less unemployment at the cost of a bit more inflation. Policymakers took up that option, but then could not understand why inflation didn’t just go up a bit, but kept on going up and up. Along came Milton Friedman to the rescue, who in a 1968 presidential address argued that inflation also depended on inflation expectations, which meant the long run Phillips curve was vertical and there was no permanent inflation unemployment trade-off. Policymakers then saw the light, and the steady rise in inflation seen in the 1960s and 1970s came to an end. This is a neat little story, particularly if you like the idea that all great macroeconomic disasters stem from errors in mainstream macroeconomics. However even a half awake student should spot one small difficulty with this tale. Why did it take over 10 years for Friedman’s wisdom to be adopted by policymakers, while Samuelson and Solow’s alleged mistake seems to have been adopted quickly? Even if you think that the inflation problem only really started in the 1970s that imparts a 10 year lag into the knowledge transmission mechanism, which is a little strange. However none of that matters, because this folk story is simply untrue. There has been some discussion of this in blogs (by Robert Waldmann in particular - see Mark Thoma here), and the best source on this is another F: James Forder. There are papers (e.g. here), but the most comprehensive source is now his book, which presents an exhaustive study of this folk story. It is, he argues, untrue in every respect. Not only did Samuelson and Solow not argue that there was a permanent inflation unemployment trade-off that policymakers could exploit, policymakers never believed there was such a trade-off. So how did this folk story arise? Quite simply from another F: Friedman himself, in his Nobel Prize lecture in 1977. Forder discusses much else in his book, including the extent to which Friedman’s 1968 emphasis on the importance of expectations was particularly original (it wasn’t). He also describes how and why he thinks Friedman’s story became so embedded that it became folklore. The reason I write about this now is that I’m in the process of finishing a paper on the knowledge transmission mechanism and the 2010 switch to austerity, and I wanted to look back at previous macroeconomic crises. If it wasn’t a belief in a long run inflation unemployment trade-off, what was it that allowed inflation to gradually rise during those two decades? Forder has a lot to say on this, but the following is my own take. I think two things were critical: the idea that demand management was primarily designed to achieve full employment, and that full employment had primacy over the objective of price stability. Although more and more economists over that period began to see the policy problem within a Phillips curve framework, many still hoped that other measures like prices and incomes policies (in the UK in particular but also in the US) could override the Phillips curve logic. The primacy of the full employment objective meant the problem was often described as ‘cost-push inflation’ rather than a rise in the natural rate of unemployment. If you find this hard to imagine, think about historians discussing the current period in a possible future in 2050. By then nonlinearities in the Phillips curve and the power the inflation target had in anchoring inflation expectations were firmly entrenched in mainstream thinking. Imagine that partly as a result in 2050 the inflation target has been replaced by a level of nominal income target. With the benefit of hindsight these historians were amazed to calculate the extent to which resources were lost decades earlier because policy had become fixated by a 2% inflation target and budget deficits. They will recount with amusement at the number of economists and policymakers who thought that the way to deal with deficient demand was by ‘structural reform’. Rather than construct folk tales, they will observe that even when most economists realised what was required to avoid being misled again policymakers were extremely reluctant to change the inflation target. The UK budget included the creation of an employer levy to help finance a large increase in apprenticeships. It is a key part of this government’s belated attempts to deal with poor productivity growth, although lack of workforce skills has been a UK problem for as long as I can remember. I hope the goals are achieved, but this is not my area so I cannot comment on whether they will be. Instead let me tell an anecdote, and reference two good sources. After I left H.M.Treasury, I found myself in a forum discussing Mrs. Thatcher’s economic policies. The person defending the government was a Treasury economist that I had worked for, and who was no fool. Most of the questions raised were macro, so I had no problem making critical comments. But then a question on apprenticeships came up. In the 1970s there was an apprenticeship levy covering most of British industry, administered by tripartite bodies. The Thatcher government had just begun dismantling that levy. As this was hardly my field, I feared I would have nothing to contribute. But all my former colleague could say to defend the government’s dismantling of the levy system was that the government believed that individual employers were far better placed to do their own training. I could not believe what I was hearing. Even with the little microeconomics I had, I could see the flaw in that argument. Training employees with non-firm specific skills involved an obvious problem for the employer - the employee can be tempted to move to another firm, and the original firm gets nothing back from their investment. Firms that did pay for apprenticeships would always be vulnerable to others that attempted to free ride and poach their skilled labour. Two good recent pieces on apprenticeships are this short piece from Hilary Steedman, and something more detailed from Alison Wolf. It is fascinating when two highly respected, internationally known economics professors at London universities (LSE and UCL) disagree about a policy on which they are both experts. The policy is the increase in the national minimum wage (NMW) contained in the last Osborne budget. The disagreement is not the one you might expect, and nor do I think it reflects underlying differences (if any) in the politics of the two individuals. The debate is often between those who appeal to standard theory that says raising the NMW must reduce employment, and those who appeal to the evidence which says this hardly happens. But in this case the theorist, Alan Manning, is arguing for the policy of a higher NMW, while it is the empiricist, Steve Machin, who disapproves of the policy. Although the argument here is essentially about the politicisation of setting the NMW, you could argue that he is also implicitly suggesting that by setting a NMW substantially above levels recommended by the LPC Osborne will do more harm than good. He argues that this experiment will give the LPC a new lease of life as it evaluates the results of the experiment. I have no clear idea who is right. However we can make some progress by looking at which industries employ most on low pay. James Plunkett has a nice diagram here, and he argues that most sectors can easily afford to pay higher wages without reducing employment (or more precisely, that at the moment the rents that come from labour market frictions are mostly taken by the employer): sectors like retail or food and beverage services. An exception is residential care, but as he and Manning note, the price for these is largely determined by the government. I agree with Machin that it is good to delegate complex economic issues like setting the NMW to expert bodies like the LPC. However it is also difficult to imagine such institutions ever saying why don’t we take a risk and do an experiment. It is also significant that the political intervention in this case does not fit the natural inclinations of the political party in power. In this case who turns out to be right will depend on whether this intervention is a one off or becomes a habit, and the reaction of whoever is Chancellor if the LPC judges the experiment to have failed. An alternative argument is that both employer and employee will reap benefits from higher wages, because these will encourage higher retention and productivity. These efficiency wage arguments are discussed by Ben Chu. Even the seasoned political commentators who are sympathetic to Labour cannot understand the reported popularity of Jeremy Corbyn, the left wing candidate for the Labour Party leadership. Perhaps those party members with more centrist views have left during Miliband’s leadership, they muse, leaving constituency parties dominated by the far left. These commentators may be right that if Corbyn was elected it would be electorally disastrous for Labour, but in failing to correctly understand his relative popularity they show how dangerous the Westminster bubble has become. It is not Labour party members who have changed, but the position of most of their potential leaders. Although Labour tabled amendments to this bill, after those were inevitably defeated it abstained rather than voting against. Of the four leadership candidates, only Corbyn defied this party line. Labour did not vote against this bill despite the inevitable result that it will increase child poverty. Indeed, an apt title for this bill would be the ‘Increasing Child Poverty’ bill. One of the great achievements of the last Labour government was to reduce child poverty, largely through the system of tax credits, and today’s Labour party has abstained on a bill that will set about dismantling and reversing that. I doubt if any Labour Party members think now is the time to start increasing child poverty. They wanted child poverty reduced under the last Labour government, and with the number using foodbanks in the UK rocketing, they hardly think now is the time to reverse that. For many party members reducing poverty is a core Labour value - it is one of the reasons they joined. So why on earth did Labour not vote against this bill? The main reason Labour gives is that they must ‘listen to the electorate’. Measures to ‘reduce welfare’ are popular among voters. It is popular because voters constantly see stories in the press and TV about people living the ‘benefits lifestyle’, and justifiably resent that. This is what people mean by ‘reducing welfare’. But if you ask people about child poverty, they overwhelmingly believe that it should be a government priority to reduce it. There are not stories about the hardship that poverty causes every day in the media, and how the welfare system is vital in preventing even worse. So welfare is associated with supporting scroungers rather than reducing poverty. The other excuse often given by Labour MPs for supporting measures of this kind is that they need to show they are competent to run the economy, which alas nowadays means reducing the deficit. Yet we know there is no macroeconomic logic in reducing the deficit as rapidly and as far as Osborne plans. Again Labour appeal to what voters believe, never mind the reality. In addition, this government is cutting inheritance tax for the better off. So not opposing this welfare bill is equivalent to saying that the children of the poor must pay so that the rich can pass on more of their wealth. This electoral strategy of moving the party to the right by abandoning its core values seems doomed to failure. Unless the plan is to outdo the Conservatives in dismantling the welfare state, Labour will always be seen as ‘soft on welfare’ by the electorate. Even if they voted with the government on every single deficit reduction measure, the Conservatives will still argue that Labour’s claims to be competent at running the economy are not credible, and use the unchallenged assertion that Labour caused austerity as evidence. In addition, following the Conservatives to the right is potentially suicidal because it takes for granted that those on the left will continue to vote for them. “The truth is the Tories do not have to cut £12bn from welfare: they are choosing to. The Liberal Democrats will always stand up for families. We will not let the Conservatives, through choice, and the Labour party, through silence, unpick our welfare system." I’ve also seen it reported that he said he would have attended the recent anti-austerity march. If he campaigns against what he could call Osborne’s ‘excessive and obsessive austerity’, his eclipse of Labour on the left is assured. For those who think that poverty should be reduced and the rise in food banks is an indication of social failure, it will be pretty obvious who to vote for in 2020. Whether you can describe Irish unemployment rising from 12% in 2009 to 14.7% in 2012 as a success is of course moot. But Ireland does give us a clear example of how austerity is supposed to impact an open monetary union member, according to standard theory. A permanent reduction in government spending or higher taxes will increase unemployment, which will reduce wages and prices. This will improve competitiveness, leading to higher external demand for Ireland’s products (and less imports) which will eventually replace the lost demand due to austerity. However, because wages and prices are ‘sticky’, this adjustment will not happen quickly. The fact that Ireland is now growing strongly and unemployment is falling reflects this process. The OECD estimates that growth in 2014 was nearly 5%, and this was greatly helped by a 12% increase in the volume of exports. In this sense Ireland’s response to austerity has been textbook. The interesting question is why Greece has been so different. Here is growth in the two economies (all data comes from the OECD’s Economic Outlook). .
Of course the 2009 recession affected everyone, but from 2010 until 2014 the Irish experience was bad, but for Greece it was a disaster. 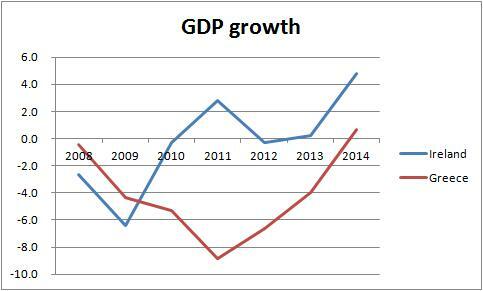 The most important reason for the difference is straightforward: there has been a lot more austerity in Greece. Here is one summary measure: the underlying government primary surplus. Looking at this measure the fiscal contraction between 2009 and 2013 in Greece has been 2.7 times greater than in Ireland. This measure is not ideal because the impact of tax changes can be smoothed, but looking at changes to government consumption gives a similar picture. In both cases we have had what economists call ‘internal devaluation’, which is the improvement in competitiveness that I described earlier. 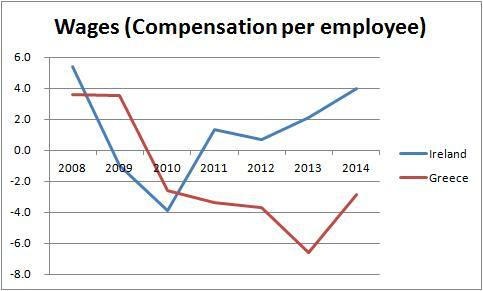 Here is what has happened to wages. The fall in wages in Ireland produced a significant improvement in competitiveness, which is a major factor behind why exports are now booming. With much more, and more persistent, unemployment in Greece, the fall in wages has been much more persistent. So we would expect a much larger and more persistent improvement in competitiveness and exports. But here we have a small puzzle: neither has happened. 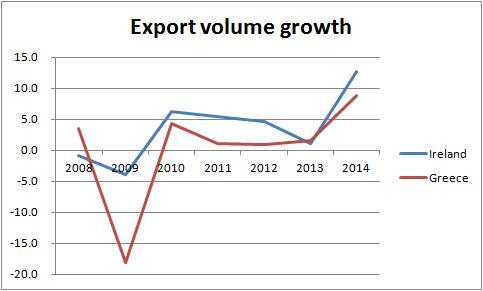 Here are export volumes in both countries. The pattern is similar, but if anything the improvement in exports has been greater in Ireland than Greece. Is this where stories of structural weaknesses in Greece come in? In one sense yes. Greece certainly exports less than you might expect given the usual (‘gravity’) models that economists use to explain such things, as this European Commission study shows. The study also argues that you can explain this finding by institutional weaknesses in Greece’s economy. That in turn is one factor behind a very important difference between Ireland and Greece. Ireland is much more open, which means that any percentage increase in exports will have a much bigger impact on GDP and employment than in Greece. (It also receives much more foreign direct investment.) In technical terms, if the slope of the Phillips curve is similar in both countries, Greece’s adjustment was always going to be more difficult, because it is a much less open economy. To what extent these increases in energy taxes were sanctioned by the Troika is unclear. However one of the measures imposed as part of the latest agreement is an increase in VAT for the tourist industry, which of course will also hit competitiveness in that industry. In both these cases, austerity measures have and will actively hinder the way the economy adjusts to fiscal consolidation. To sum up, the main reason Greece has suffered so much more than Ireland is that the amount of austerity imposed on Greece has been much greater. Any recession is also likely to be greater because Greece is a less open economy, so a larger internal devaluation is required to offset the impact of austerity. One final factor is that large cuts in wages have not been translated into improvements in competitiveness, in part because of the way austerity was implemented. My recent post on this was in one way generous to some Labour party figures. It assumed that they knew that George Osborne’s ‘going for surplus’ was a bad policy, but felt they had to follow it to regain credibility in handling the nation’s finances. The idea that because the economy is growing we should be having fiscal retrenchment makes the schoolboy error of confusing levels and rates of change, and this is certainly not an error that Keynes would have made. In the 1920s and 1930s, when UK unemployment was never below 6% and often much higher, UK growth was often positive and sometimes strong - was that a good time for fiscal retrenchment? Tristram Hunt was originally a lecturer in modern British history, so maybe is unaware of this letter from Keynes to Roosevelt after the disastrous US return to austerity following strong growth in 1937. Putting Keynesian issues to one side, Tristram Hunt repeats the idea that fiscal retrenchment is sensible because of the amount that the government pays in debt interest. Paying debt interest may be costly because of the distortions created by the taxes needed to pay it (or the missed opportunities for public spending), but taxes also have to rise (or spending to fall) to reduce debt. As I discussed here, a recent paper from the IMF makes it clear that this is not a good argument for austerity. All of which raises an intriguing question. Where is this nonsense economics coming from? Tristram Hunt makes many of the same mistakes as Chuka Umunna made in a speech I also criticised – is that coincidence? I cannot believe that any academic economist, whatever their views on fiscal rules, would make errors as obvious as these. Are they simply parroting stuff that comes from the Conservative Party, which is repeated in much of the press? Does it come from some City economist? If anyone knows, please tell me (confidentially by email if necessary). As Tony Yates among others has observed, antagonism towards using fiscal policy for macroeconomic stabilisation seems to be an essential part of market monetarism. However their argument is not that fiscal policy will have no impact on demand and therefore output, but rather that monetary policy can always offset this impact. This can be called the ‘monetary offset’ argument. As I have noted before, the idea of monetary offset is actually a key part of Keynesian objections to austerity in a liquidity trap . In a liquidity trap monetary policy’s ability to offset fiscal austerity is severely compromised, but at other times it can be done. It therefore makes much more sense to postpone austerity until a time when monetary offset is clearly possible. So the idea that monetary offset can happen is common ground. What is in dispute is the extent to which a liquidity trap (or almost equivalently the fact that nominal interest rates cannot become too negative) prevents complete monetary offset. If empirical evidence could be found that complete monetary offset has operated during a liquidity trap that would be powerful support for the market monetarist case. Scott Sumner recently presented (HT Nick Rowe) some analysis by Mark Sadowski which he said did just that. 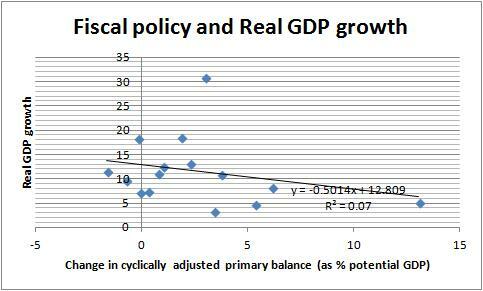 Taking the cyclically adjusted primary balance as a measure of fiscal policy, it showed that there was no correlation between this and growth in nominal GDP in the single period from 2009 to 2014 for those countries with an independent monetary policy. There are tons of problems with simple correlations of this kind, some of which I discuss here, which is why quite elaborate econometric techniques are nowadays used to assess the impact of fiscal policy. But there is a rather simpler problem with this correlation. As far as I know, no one had expressed a concern about fiscal austerity because of the impact this will have on nominal GDP. The issue is always the impact on real activity, for reasons that are obvious enough. 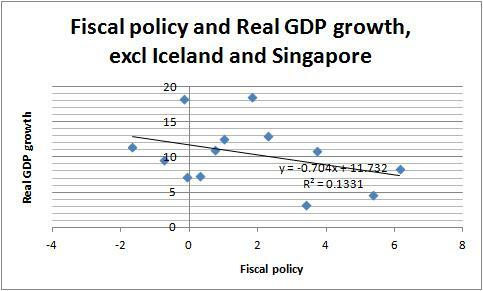 So what happens if we relate fiscal policy to real GDP growth, using Sadowski’s data set? Here is the answer. There are two obvious outliers here: at the top Singapore, and to the right Iceland. Exclude those and we get this. If you were to conclude that we just do not have enough data to know to what extent monetary offset can operate in a liquidity trap, I think you would be right. If you then went on to say that therefore the data cannot discriminate between the two sides in terms of policy, you would be wrong. What market monetarists want you to believe is that there is no need to worry about fiscal austerity in a liquidity trap, because an independent monetary policy can and will always offset its impact. This is wrong, precisely because the empirical evidence is so limited. We know, both from theory and the great majority of econometric studies, that fiscal contraction has a fairly predictable impact in reducing GDP. We have virtually no idea how much unconventional monetary policy is required to offset this impact. Given lags, that means trying to achieve monetary offset in a liquidity trap is always going to be hit and miss. The moment you think about uncertainty, the market monetarist argument for not worrying about austerity in a liquidity trap falls apart. It is not the only reason why fiscal austerity in a severe recession might be a bad idea. There is a lot of empirical evidence that the impact of austerity is greater in recessions than when the economy is stronger, and there are other theoretical reasons besides monetary offset why that may be the case. This is of some importance for individual economies in a monetary union. If the coefficient on fiscal policy was lower for this sample than for Eurozone countries (I’ve not tried), would that at least be evidence for some monetary policy offset? The trouble here is that some of the countries driving the EZ results were also suffering from an overvalued real exchange rate as a result of earlier excess demand, and so this might bias upwards the coefficient on fiscal policy in those regressions. Nick Rowe pulls me up on a point that I didn’t make in my account of what should have happened to Greece after 2010. I argued that some external body (e.g. IMF) should lend sufficient money for Greece to be able to achieve primary surplus (taxes less non-interest government spending) gradually, thereby avoiding unnecessary unemployment. Gradual adjustment is required because the improvement in competitiveness required to achieve ‘full employment’ with a primary surplus cannot happen overnight because of price rigidity. Nick’s point is that for this to happen, the external body has to have a degree of trust in Greece: trust that it will not take the money and at some stage default on this new loan. This trust may be particularly problematic if Greece had defaulted on its original debt, which I think it should have done. This, after all, is one reason why Greece would not be able to get such finance from the markets. You could argue with much more justification that the failure of trust has been on the Troika’s side. Greece was told that the austerity demanded of it would have just a small impact on growth and unemployment, and the Troika were completely wrong. They were then told if they only implemented all these structural reforms, things would come good, and they have not. You could reasonably say that the election of Syriza resulted from a realisation in Greece that the trust they had placed in the Troika was misguided. Given these failures by the Troika, a reasonable response to the election of Syriza would have been to acknowledge past mistakes, and enter genuine negotiations. After all, as Martin Sandbu points out in a separate piece, a pause in austerity in 2014 had allowed growth to return, and because Greece had achieved primary surplus new loans were only required to repay old loans. But it is now pretty clear that large parts of the Troika never had any real wish to reach an agreement. Over the last few months we were told (and the media dutifully repeated) that the lack of any agreement was because the ‘irresponsible adolescents’ of Syriza did not know how to negotiate and kept changing their minds. We now know that this was yet more spin to hide the truth that large parts of the Troika wanted Grexit. The lesson of the last few months, and particularly the last few days, is not that Greece failed to gain the trust of the Troika. It is that creditors can be stupidly cruel, and when those creditors control your currency there is very little the debtor can do about it. Greece was prevented from defaulting because of fears of contagion of one kind or another, which meant that Greece was taking on a burden for the sake of the rest of the Eurozone. The right response to these fears was OMT, and direct assistance to private banks, as Ashoka Mody explains clearly here. But given that this was not done, what should have then happened is that once that fear had passed, the debt should have been written off. But politicians cannot admit to what they did, so the debt that was once owed to private creditors and is now owed to the Troika remains non-negotiable. The Troika can also speak with forked tongues on this issue: see Mean Squared Errors here (HT MT). I am often told that the Troika had to stand firm because of a moral hazard problem: if Greek debts were written down, other countries would want the same. But the moral hazard argument has to be used proportionately. Crashing an economy to avoid others asking for debt reductions is the equivalent of the practice in 18th century England of hanging pickpockets. I am sometimes asked why I focus on the failures of the Troika rather than the mistakes of Syriza. The answer is straightforward - it is Troika policy that is the major influence on what happens in Greece. And when the Troika gives Greece’s leaders the choice between two different disasters, it seems rather strange to focus on the behaviour of Greece’s leaders. Imagine that the Scottish National Party (SNP) had won the independence referendum. The SNP starts negotiating with the remaining UK (rUK) government over issues like how to split up national debt. On some issue the negotiations get bogged down. Rumours start circulating that this might mean that rUK will not form a monetary union with Scotland, and that Scotland might have to create its own currency. People in Scotland start withdrawing money from Scottish banks. Now it is almost the definition of a private bank that if everyone who has an account at the bank wants to withdraw their money, the bank will run out of cash and go bust. That is why bank runs are so dangerous. It is also why one of the key roles of a central bank is to supply an otherwise solvent private bank with all the cash they need, so they will never deny depositors their money. (To be a lender of last resort.) If they did not do this, anyone could start a rumour that a bank was insolvent, and as people withdrew their cash just in case the rumour was true, the bank would run out of money and go bust anyway. So in my hypothetical story, as people started withdrawing cash from Scottish banks, the Bank of England should supply these banks with all the cash they need. Except suppose it did not. Suppose it put a limit to the amount of cash it would supply. The Scottish banks would protest - you agreed we were solvent before independence, they would say, so why are you rationing our liquidity? The Bank of England replies that although they might have been solvent before independence, if there is no agreement solvency is less clear. The Bank of England says that the limit on cash will remain until the Scottish and rUK government come to an agreement. This announcement of course leads everyone in Scotland to try and get their money out, and the Scottish Banks have to close. The Scottish economy begins to grind to a halt. The English media report that Scotland is running out of money because the Bank of England will not ‘lend’ any more to the Scottish banks. The Scottish government is forced to agree to the rUK’s terms. The English media say look what happens when you elect a radical government. In Scotland they call it blackmail. What would you call it? If it sounds to you like the Bank of England is taking sides and putting impossible pressure on Scotland, then you will know what it feels like in Greece right now. When, on 28th June, the ECB stopped providing emergency funding to Greek banks, it took sides. Part of the ECB’s logic is that Greek banks may be insolvent if there is no agreement between the Troika and Greece (even though it is the Central Bank of Greece, and therefore the Greek people, which stands to suffer losses from defaults by commercial banks). Why should the failure to reach an agreement influence the solvency of the Greek banks? Is it because without an agreement there would be a Greek exit? But Greece does not want to abandon the Euro, and the other Eurozone countries have no formal grounds to expel Greece. Greece will only leave the Eurozone if the ECB stops supplying Euros. We reach exactly the same self-fulfilling logic of a bank run. Is it because without an agreement the Greek government would default on some of its debts, and that might adversely influence the solvency of Greek banks? But the fact that the Greek government will not get money from the Troika to pay back the Troika seems to have no implications for the underlying solvency or either the Greek state or its banks. (Paul De Grauwe discusses this further.) If the Troika can make Greece insolvent by itself withholding money we have another self-fulfilling justification. The real explanation for the ECB’s actions is much simpler. Limiting funding on 28th June was the Greek government’s punishment for failing to agree to the Troika's terms and calling a referendum the day before. The ECB was not, and never has been, a neutral actor just following the rules of a good central bank. It has always been part of the Troika, and right now it is the Troika’s enforcer. As Charles Wyplosz recounts, this is not the first time the ECB has chosen to bow to political pressure. There will be some on the left who will say of course - what else do you expect of a central bank? In response, let me go back to my hypothetical example involving Scotland and the Bank of England. I may be wrong, but I think in that case the Bank of England would have supplied unlimited cash to the Scottish banks. I may be naive, but I believe it would have realised that to do anything else was an overtly partisan political act, and recoiled from doing that. Just as I do not think it was inevitable that the Eurozone committed itself to austerity, I also think it was possible that the ECB could have been a more independent central bank. The really interesting question is why it has turned out not to be such a bank.